A hugely impressive user experience makes this 47-inch flagship LED TV fun to use, but it lacks contrast and black levels. It doesn't have the characteristics demanded of a great home cinema, but most people will love both its looks and its fabulous interface. While some brands experiment with voice control on their latest flagship TVs and others offer NFC smartphone pairing, LG has gone for the jugular by presenting the whole darn lot on this 47-inch edge LED TV. Arguably neither of those features are a must-have - not on any TV - but it's indicative nonetheless of how many dimensions there are to the LG 47LA860W. Yes, passive Cinema 3D features - amid plenty of free specs, too - but more decisive are LG's bundling of a pointer-style Magic Remote, packed smart TV pages and the industry's finest digital content arbiter, SmartShare. Attach a phone or a tablet as a source of video, stream from a Mac or a PC and SmartShare even finds cover art and all kinds of other metadata using its fabulous Plex software. The LG 47LA860W - with a full price of £1,899 (around US$2,920 / AU$3,160) - also happens to look absolutely stunning. Arguably the best-looking TV we've seen in 2013, the LG 47LA860W has a bezel a mere 8mm (0.3 inches) thick, and a depth of just 35.1mm (1.4 inches). Add a Freeview HD tuner, USB TimeShift recording and an enhanced dual-core processor that quickens the pace, and the LG 47LA860W looks every bit the flagship TV. All smart TVs from LG feature Freeview HD tuners and Cinema 3D, LG's name for the passive FPR form of 3D it exclusively manufacturers. Other 47-inch televisions in LG's massive stable include the step-down LG 47LA790W (£1,599), which loses the camera, and the LG 47LA740V (£1,549), which has three instead of four HDMI inputs. 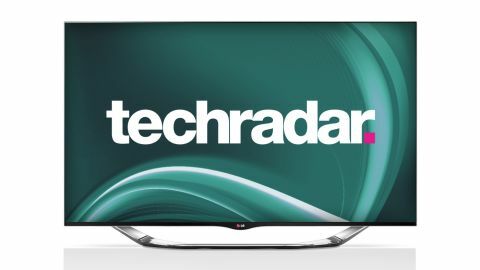 We've already reviewed the bigger 55-inch LG 55LA740V from this latter series. If you're after a 55-inch TV, why not head for LG's one-of-a-kind OLED TV, the 55-inch LG 55EM970V? There is one small problem: it sells for £10,000. If ever there was a manufacturer keen to keep pushing 3D, it's LG. The inventor of the FPR technology that uses the same lightweight 3D specs used in 3D cinemas has filled the LG 47LA860W's box with the things. There are six pairs in all - four pairs of AG-F315 specs, and two pairs of AG-F310DP Dual Play specs, which actually abandon 3D, instead using the technology to create full-screen gaming for two separate viewers at once. Clever stuff. The LG 47LA860W is also well stocked with connections. There are four HDMI inputs (all along the side, with one ARC-compatible and one MHL-ready for smartphone hook-up), which will be fine for most users. They're joined by three USB slots, one of them USB 3.0 spec, though they're all situated very high on the TV's side. All are recessed well away from the side of the TV, so trailing cables shouldn't be an issue. Also up there is a Common Interface slot. Below is where you'll find feeds for the Freeview HD tuner, wired LAN (although Wi-Fi features, too), a Scart adaptor, optical digital audio out, a headphones jack and adaptors for component video and composite video. So-called 'Premium' apps include Lovefilm, BBC iPlayer, Netflix, Livesport, BBC Sport, YouTube KnowHow, Napster, Skype, Blinkbox, Facebook, Deezer, Aupeo, Twitter, vTuner, Crackle, Red Bull TV and EuroSport Player. However, it's a bit muddled, since the My Apps page actually contains what we'd call widgets, such as shortcuts to the TV's inputs, settings, TV Guide, SmartShare and other bits. There are also links to 3D World and Games World, as well as to LG's online app store. SmartShare trades files over home networks and from USB flash drives, with MKV, AVC HD, AVI, MP4 and MPEG video files supported in our test. We also managed to get the LG 47LA860W to play OGG, WAV and AAC lossless music files, as well as the more common MP3, M4A and WMA, and these files continue to play while JPEG (only) photo slideshows commence. All of these digital files are divvied up into Recently Played and Recently Added lists by the TV, with the pick presented on the TV's main home page, which is very convenient. LG's Triple XD Engine remains one of the few that can convert any source from 2D into 3D, though a new feature for this year is Motion Eye Care, which takes the peak off full brightness. Also here is an 800Hz Motion Clarity panel that's designed to banish blur, while TruMotion is also on hand to insert guessed-at frames of video to remove judder. Lastly, it's worth mentioning that the LG 47LA860W has a somewhat limited - but hugely impressive - voice control feature, while a pull-up camera on the top enables you to make Skype video calls and snap selfies.